Exercise for seniors benefits brain fitness and can protect you from developing Alzheimer's disease. In a new study released recently, 30 minutes of exercise five times per week lowered the risk of developing Alzheimer's disease. Have you ever felt energized after a brisk walk? Even though we may be a little tired initially after a brisk walk, we generally feel energized. Many people report being more mentally alert as well. 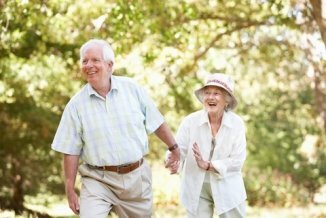 Now, a new study published in the Archives of Neurology indicates that a jog or daily walk may reduce the risk of developing Alzheimer's disease. Since there is no cure for this cognitive disorder, prevention is even more important. Exercise for seniors may indeed be protective from developing dementia. The research, completed at Washington University in St. Louis, followed 201 adults. When the study began the subjects who ranged from 45 to 88 years had no symptoms of memory loss or thinking problems on pre-tests. Researchers also tested them for the APOE-e4 gene which is known to produce Alzheimer's disease at a 15 times greater rate. The e4 variant of the APOE gene is involved in the metabolism of cholesterol. The lead researcher, Dr. Denise Head, an associate professor of psychology at Washington University, found that 56 of the 201 volunteer subjects carried the e4 variant of the APOE gene. The researchers gathered information on the exercise habits of the volunteer subjects of the study. They examined their habits during the past 10 years. They were particularly interested in exercise because some studies with people and animals completed previously had shown that regular exercise can protect people from Alzheimer's disease. But, still other studies had not shown this effect. The study used the guidelines of the American Heart Association. They recommend exercise of 30 minutes at moderate or vigorous levels five times a week. A brisk walk qualifies. When Dr. Head and her colleagues looked at the results they found that exercise did help and provided some benefit. But the greatest benefit was for the volunteers with the e4 gene variant who are prone to developing more amyloid plaques in the brain. This is known to cause Alzheimer's disease. Those people with the gene known to be a major risk for developing Alzheimer’s disease in the study, who had been exercising had the similar levels of amyloid plaque as those who did not have the e variant gene. In other words, exercise protected them from the inherited risk for developing Alzheimer’s disease because they exercised. Bottom Line: 30 minutes of brisk exercise 5 times per week can modify the risk of developing Alzheimer's disease in those with 15 times greater risk of developing the disease. There are many benefits from exercise for seniors but one of the greatest may be the protective benefits from developing serious memory loss. Reference: Exercise Engagement as a Moderator of the Effects of APOE Genotype on Amyloid Deposition Head et al. Arch Neurol.2012; 0: 20118451-8.